What good a crossword puzzle can do to you? Ever wondered? Well, yes, of course it’s fun, productive, rejuvenating, relaxing and all the other positive things you can think about; but, what else? Is there anything other than these traits that a crossword puzzle has? Well, had these questions been raised a few years back, there probably wouldn’t have been an answer but, since there is an exceptionally amazing free crossword game with you can make money playing games online now, each and every question of these have an answer in the form of “Wealth Words”. Yes, the new age, contemporary online crossword that has totally transformed the world of puzzles for good. Though it also is carrying the legacy and rich history of crosswords dating back to 19th century, what makes it different from the old school puzzle is its digitally driven approach while emerging as a real money earning game. Not that it doesn’t have any competition. In fact, there are a lot of online crosswords doing the rounds of internet. However, what makes Wealth Words stand out amidst its counterparts is its cash prize strategy where it lets its players can make money playing games as high as a whopping $1600 just by playing and answering a few simple puzzles of this crossword right. Now, isn’t that enough to give it an edge over its competitors? It certainly is. So, if you are a crossword aficionado or someone who simply loves the twists and twirls of these cryptic puzzles, Wealth Words can be your go to name then. In fact, even if you’re a novice or someone who has no clue about crosswords, you can try your luck at Wealth Word. After all, it’s always good to have some extra cash in hands, isn’t it? And, especially when you can acquire it all just through a simple game of words effortlessly! Hence, why not give your best puzzling shot here and win some grand cash prizes out of it? Trust me, it’s going to be one hell of a roller coaster ride. However, before you unleash your inner wordsmith with Wealth Words and laugh all the way to bank; there are certain guidelines you need to follow to ace your puzzling skills at this online crossword puzzle game. Registration is required: Yes. Wealth Words requires you to register at its website in order to let you play its various word games. You can either register through your e-mail or do it through your Facebook account, whichever suits your preferences. Token purchase: This is an important aspect too of Wealth Words. Before you dive in its world of words, a token purchase of $2 each is needed to be done. But, hey! It’s nothing in front of the cash prizes you’re going to take home. So, absolutely no worries here! Follow the active time frame: To be in the ultimate race of winning, make sure you correctly catch the clues that come your way and submit your answers in an active time frame of an hour. A particular time limit has been set for every player to give everyone an equal chance to participate and win big here. The divisional prizes: Wealth Words distributes prizes in the form of division 1 and division 2. While answering all of its 20 puzzles right can land you amidst its division 1 cash prizes, the division 2 cash prizes can be made yours by giving the next highest correct answers. The active games: Apart from its divisional prizes, Wealth Words also has a plethora of active games ranging between 2 to 20 words with cash prizes ranging anywhere between $50 to $1600. Open games: Open games as the name itself suggests are open to everyone i.e, it is a free daily crossword which lets crossword lovers hone their puzzling skills without any registration or token purchase. Now, since you know it all, isn’t the crossword aficionado within you craving to come out and quench its crossword cravings? 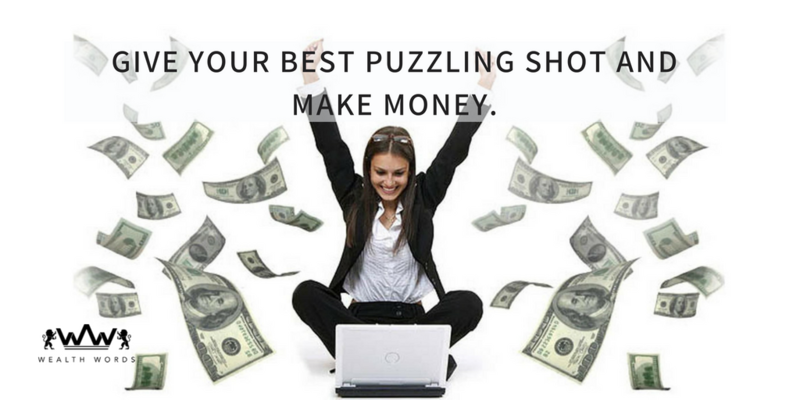 If this is the case, then it’s high time you put your best puzzling foot forward and showcase your word power to make all these amazing cash prizes solely yours. Much luck, crossword lovers. Nail it!